If you're preparing for a holiday meal or just want to impress guests with your napkin origami, fold your napkins into five-pointed stars. This is a simple DIY project that adds a festive element to your table setting. These instructions are based on traditional paper origami star diagrams for a similar shape. 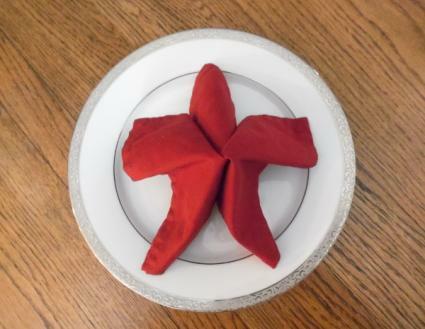 If you're folding napkin stars for a holiday, choose a napkin color to add to the effect. For instance, use gold, green, or red napkins for Christmas stars or red, white, or blue napkins for Independence Day. Use a napkin that has been starched. The starch makes it easier to perform the creases you'll need to give your star a finished look. Before you begin folding, make sure your napkin is perfectly square. Even slight differences in the dimensions can interfere with the look of the finished star. 1. Place your napkin in front of you in a diamond shape, with the front side of the napkin face down. Fold the napkin in half diagonally. Use your iron to crease the fold if needed. Use the steam setting on your iron to make your creases even more precise. Keep a bottle of liquid starch handy to set the creases as you work. 2. Fold the left and right sides of the triangle up to the top, creating a smaller diamond shape. Crease the folds with your iron if needed. 3. Carefully flip your napkin over. Fold it into a smaller triangle with two open flaps at the top. 4. Fold your triangle in half along the vertical crease, standing it upright on your plate. 5. Place your napkin on your plate. Open the flaps on the left and right sides and make squash folds to form the points of your star. Squash folds are made by sticking your fingers inside the flap and pressing down. Don't press as firmly as you would if you were folding paper, however. This project needs to stand upright slightly to form the star shape. 6. You can continue to gently pull and place the star's corners once it's standing upright. Just be careful not to pull the whole shape apart! Since cloth is less rigid than paper, folding napkins is a different experience than making paper origami. Even if you're experienced in paper folding, slow down and follow each step in the project carefully for the best results. If you get frustrated, remember that you can simply iron out all your creases and begin again!